Isoseismal map of the Weber II earthquake. Courtesy Atlas of isoseismal maps of New Zealand earthquakes (2nd edition): Downes, G.L. ; Dowrick, D.J. 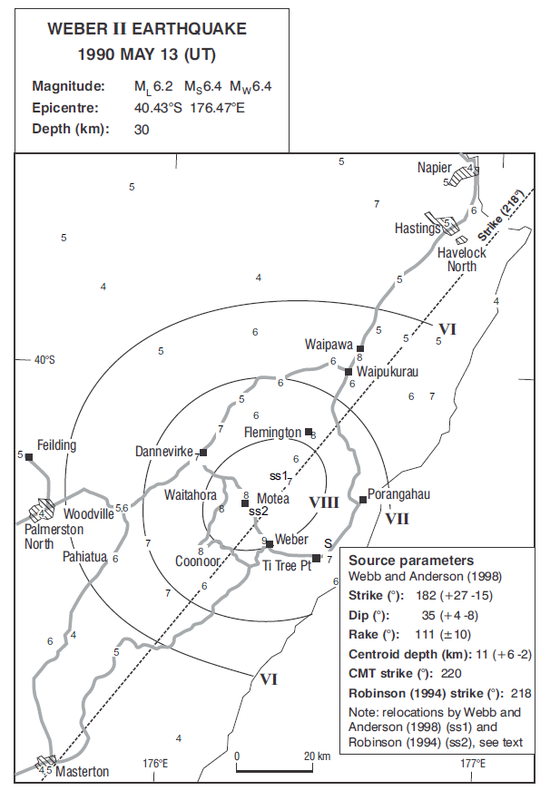 This was the second of 4 large earthquakes to shake the Weber region, in the south-east of the North Island, between 1990 and 1992. It was felt widely from Hamilton to Takamatua Bay on the Banks Peninsula, reaching a maximum intensity of MM 9 in Tarewa. As with many moderately sized earthquakes, the intensities experienced in different locations were influenced by the stability of underlying soils and sediment in each area. Consequently, poorly consolidated areas experienced more intense shaking and suffered more damage.